This easy celery soup recipe is surprisingly elegant and won't break the bank. A little cream wouldn't go amiss either. Each serving provides 401kcal, 17g protein, 47g carbohydrate (of which 9g sugars), 15g fat (of which 2g saturates), 6.5g fibre and 1.3g salt. Heat the oil in a saucepan and cook the garlic, onion and celery over a low heat for five minutes, until softened. Add the chicken stock and simmer for 10-12 minutes. Transfer the soup to a blender and liquidise. 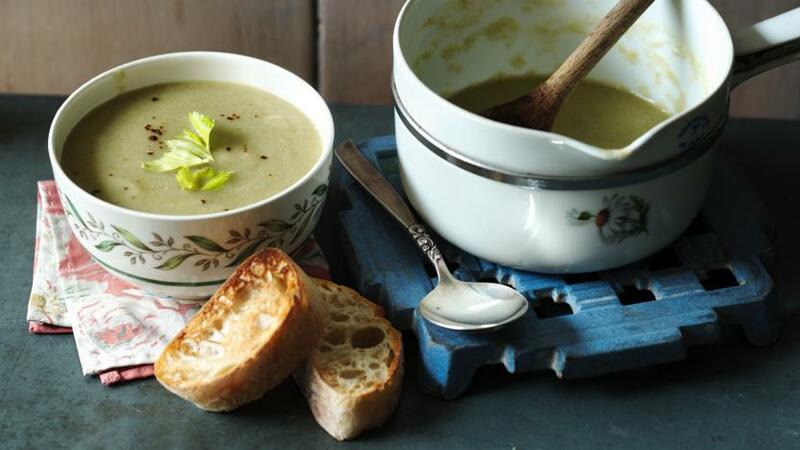 To serve, place the soup into a bowl with the toasted ciabatta alongside.